The oil and natural gas market for pipe is expected to continue recovering from historic lows in 2016. Building construction activity will continue to experience healthy growth. Water and wastewater infrastructure spending is expected to increase. Value demand for steel pipe fell drastically between 2014 and 2016 as oil prices and oil and gas drilling activity plunged to historic lows. Most major suppliers suspended some of their steel pipe production during this time, citing both weak domestic demand and greater competition from low-priced imports. Demand for steel pipe used in the oil and natural gas market rebounded in 2017 as oil prices began to recover. Producers have since resumed production on stalled lines. Leading producers also expect the Trump administration’s 25% tariff on most imports of steel to boost US manufacturing of steel pipe by reducing foreign competition. Plastic pipe has captured considerable share from traditional materials such as metal and concrete in the potable water, storm and sanitary sewer, and irrigation markets. Historically, gains in share occurred in applications requiring small- to medium-diameter pipe because plastic costs less and performs comparably to metal and concrete in these sizes. In larger diameters, plastic pipe could not previously compete with the structural strength of metal or concrete. However, improvements in resin formulations and processing techniques are enabling the production of larger diameter PVC and HDPE pipes that offer sufficient crush resistance and are less costly to extrude. HDPE’s flexibility makes it well suited for trenchless installation methods such as sliplining and horizontal directional drilling. PEX’s flexibility also facilitates installation in the water distribution market, as it can be bent around obstacles and cut easily. 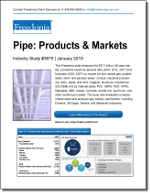 This Freedonia industry study analyzes the $37.2 billion US pipe industry. It presents historical demand data (2007, 2012, and 2017) and forecasts (2022 and 2027) by market (oil and natural gas; potable water; storm and sanitary sewer; conduit; industrial processing; drain, waste, and vent; irrigation, structural, mechanical, & OEM) and by material (steel, PVC, HDPE, PEX, CPVC, fiberglass, ABS, copper, concrete, ductile iron, aluminum, clay, other nonferrous metals). The study also evaluates company market share and offers competitive analysis on key industry participants, including Forterra, JM Eagle, Tenaris, and Zekelman Industries. Also referred to as ducting. Pipe that provides a protected, unobstructed pathway for communications, control, and electrical wiring, as well as other conduits (known as innerducts). Pipe that removes waste from a building or structure, consisting of two primary parts: pipe used for waste removal and pipe used for venting purposes. Pipe used for transmission of crude oil or natural gas from the wellhead to refinery, utility, or distribution system or in the transportation and distribution of other fluids that are used in or are byproducts of oil and natural gas production. Tube produced to closer tolerances than other pipe. Oil country tubular goods: pipe used in oil and natural gas drilling, including oil and natural gas well casing, production tubing, and drill pipe. Potable water pipe comprises all of the systems required to deliver safe drinking water and potable-quality water for other uses, such as fire suppression and radiant flooring. Networks of pipe that provide potable water to rural homes and farms, including water mains and well pipe such as casing drop, drop pipe, and discharge pipe. Pipe that conducts waste and wastewater from commercial, industrial, and residential establishments to treatment plants for eventual discharge into primary water sources. Pipe that connects a building’s water supply lines to the water main. Storm sewer mains carry storm runoff and serve as trunk lines leading to lakes, rivers, or other bodies of water. Small diameter drainage pipes transport excess water from surface soil around residential and commercial structures into storm sewer trunk lines. Large diameter culverts are considered drainage pipe for the purposes of this study. Pipe used for load-bearing purposes in the construction of buildings and in equipment such as oil rigs, farm equipment, trucks, and ships. All water piping within commercial, industrial, and residential buildings, including potable water supply, fire sprinkler, and radiant flooring lines. Large diameter pipe (usually 24 inches or greater) that transports potable water from treatment plants and branches into smaller diameter water main networks (4 to 12 inches, sometimes 16 inches for larger systems).